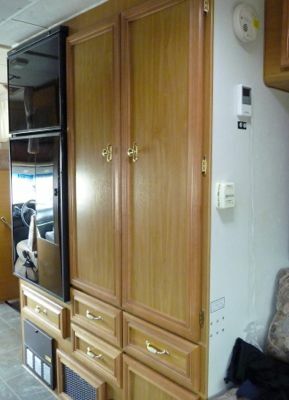 The galley or kitchen has lots of cupboards, adequate counter space, and all standard appliances. It’s also close to the dinette table, so very little walking is needed. A double-bowl sink sets at an angle in the corner. It has a high rise faucet and the spout comes out to function as a sprayer. Under the sink is a storage cabinet where I keep cleaning supplies. On the wall behind the counter, you can see my magnetic knife holder, a caddy that holds flatware, a small cutting board, and the paper towel holder. Behind the sink and next to the window are two baskets; one holds fruit and the other miscellany. The counter is molded Formica and has a faux granite pattern. At the right end is a drop-down extension. To the right of it, with the painting on it, is the door to a pantry. Check out the Three Handy Mods post for details about it. The extra space has really helped to organize my dry goods. Above the counter are cabinets with a 1100 watt Dometic microwave, and a fluorescent light fixture and 120V AC outlet beneath. A large window extends the length of the counter. It slides open, and has a screen and blinds. Below the counter are three drawers that hold sandwich and trash bags, measuring spoons and cups, can opener, pizza cutter, knife sharpener, and assorted kitchen tools. The upper cabinet on the left holds dry goods, like tea, oatmeal, dry beans, olive oil, etc. In the right, is wax paper, aluminum foil, paper plates, napkins, a thermos, etc. 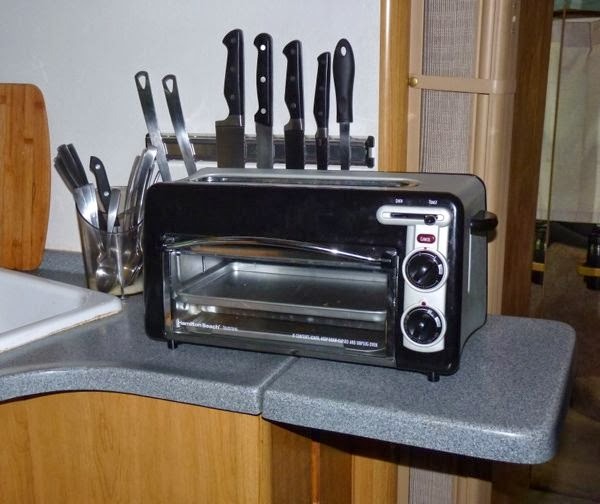 With the counter extension up, the Hamilton-Beach Toastation toaster-oven fits nicely, and plugs into the AC outlet below. The slot on the top can handle bread and fat items like bagels. When not being used, it is stored in an overhead cabinet. To the left is an Atwood Wedgwood Vision three burner propane stove with built-in piezo lighter. The small oven has one shelf, and I’ve added a pizza stone to help even-out the temps when baking. 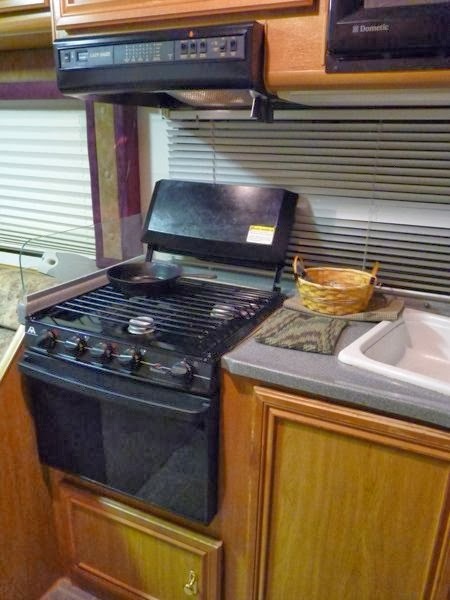 The stove has a fold-up top that protects the window when up, and adds workspace when down. There’s also a glass divider on the left edge that prevents spatters from reaching the couch. There’s a range hood over the stove that includes an exhaust fan and light. The face of the hood has gauges that tell the state of water, propane, batteries, and holding tanks; and has switches for the water pump and water heater. You might notice the salt and pepper grinders tucked up under the hood. A cabinet below holds pots, skillet, and baking pans. On the opposite wall is a Dometic 7 cu.ft. 2-door refrigerator-freezer which is powered by propane or electric. It senses which you are using and switches accordingly. The reefer also has an external readout that tells the interior temperature. 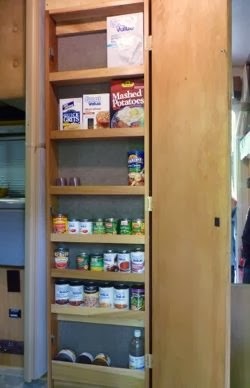 It has the typical shelves and bins for food storage. The drawer below the frig holds plastic containers, the one in the upper center holds dishes, and the one to the right stores spices. The center bottom one has various hand tools and parts that remain convenient. The dark square, at lower left, is the electric power center with breakers, fuses and a converter. 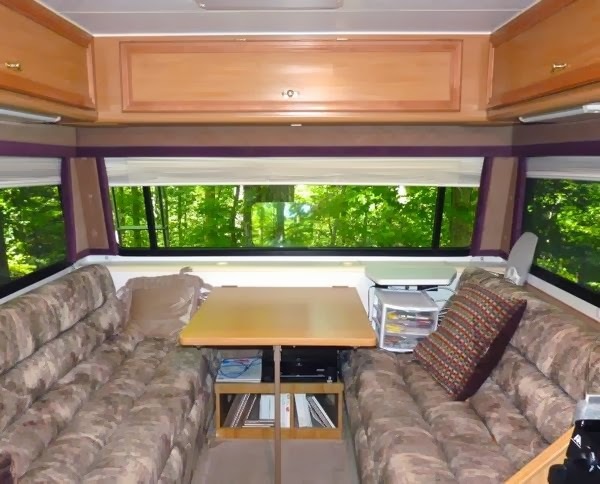 The 31×35 inch dinette table sets between the two couches and next to the rear window. An 18 inch extension makes enough room to seat four comfortably. It’s close enough to easily serve, and yet far enough away that it feels separate. The floor in the kitchen is linoleum with a faux stone tile look. On the ceiling can be seen the air conditioner, a light, and the crank to raise the Winegard TV antenna. 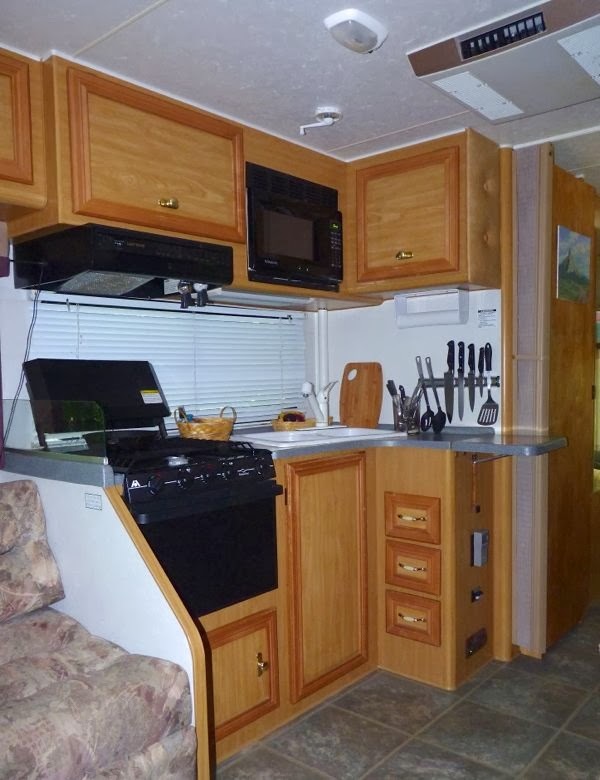 This is a very serviceable kitchen that has all the storage and features I could want. It makes preparing meals really enjoyable. Wow the place looks so spotless. Sara: Thanks for that compliment. I’ve developed the habit of putting things away as soon as I’m finished with them. It makes a difference in a small rig like mine. Glad you are having fun old friend. Until I read your accounts of your class C RV I had not even considered one, and had only heard of Lazy Daze. The rear lounge area takes the cake really making a nice experience . And moving the toilet forward is a very good idea. Looking at their website they have a lot of pride in their product. You’re right Jon. Lazy Daze has done a fine job of refining the layout; and I just love the panoramic windows at the rear. And, it is one of the best made motorhomes on the market. I’m really happy I found this one.